Millions of Ukrainians perished in Auschwitz; but history by the victors records only the few Ukrainians sided with the Nazis. The persons examined suffered from broken ribs, fractured limbs, fractures of the vertebral column and bones of the face, as well as various wounds, ulcers, and frozen hands and feet, the results of the tortures permitted by the Germans. Very many of the liberated prisoners suffered from severe nervous and psychological disturbances. The forensic medical commission held an examination of the corpses of 536 prisoners found on the grounds of the camp. It was established that in 474 cases (88.3 percent) the cause of death was exhaustion." 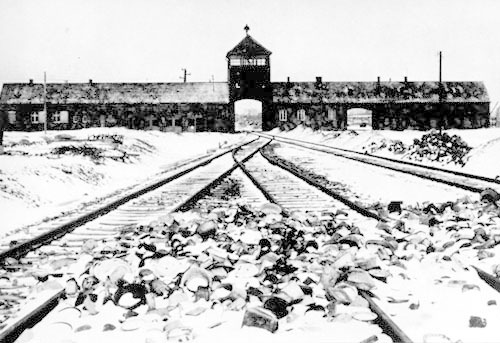 TUESDAY marked the anniversary of the liberation of Auschwitz. Tanks of the First Ukrainian Front broke through the enclosures 70 years ago.